Place the chicken breasts or veal steaks in between 2 sheets of plastic cling film. Use a rolling pin or a meat mallet and bash to flatten to about 1.5 cm thickness. Dip in seasoned flour, shake off excess flour. Dip in beaten egg and then in breadcrumbs. Heat about 2 cm deep oil in a frying pan and fry until golden and cooked. Place on absorbent paper to drain off excess oil. 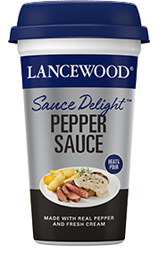 Serve with LANCEWOOD Sauce Delight™ Pepper Sauce.